We receive quite a few questions about repowering the older John Deere garden tractors. One of the most common models asked about is the John Deere 317. These 1979 to 1982 era garden tractors are well built and worth repowering. They were originally powered with the Kohler KT17 engine that had some serious design flaws. This engine gave a good tractor a bad reputation. The KT17 Series I engine had a poorly designed main bearing on the crankshaft. It had an oil pump, but the oil pump did not pump the oil to the most important place, the connecting rods. It used a splash system on the connecting rods and you were instructed not to drive the tractor on hills. This engine breaks a connecting rod and the piston stops up against the head. It will sit there and run with no knocks with one piston standing still. 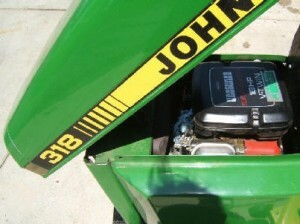 Q: I have a John Deere 317 garden tractor with the original Kohler KT17 engine. This past mowing season I noticed oil draining from the blow by vent. Is there much entailed to installing the Vanguard engine in the JD 317? The tractor is in very good condition but I use it for tilling our small garden and mowing my 1 acre. Does your repower kit require any sheet metal alterations to the side guards? Is the 18HP engine your recommendation or a larger HP engine? I run the power flow collection system when I mow and use the tiller. I was wondering if a larger engine would be less stress on the engine. A: The 18 horsepower Vanguard engine would easily have more than enough power. The Vanguard 18 horsepower puts out a short 20 horsepower as this engine is a little under rated. You do not have to cut any sheet metal. When you get done it will be a nice neat job and you will almost think you have power steering. 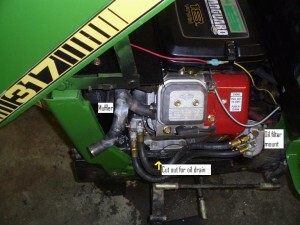 We have installed many Vanguards engines in dozens of John Deere 317 garden tractors. That is the only way to go. I get quite a few questions about Craftsman garden tractors and they have been a pretty popular brand over the years. We have repowered some and repaired some here at our shop. 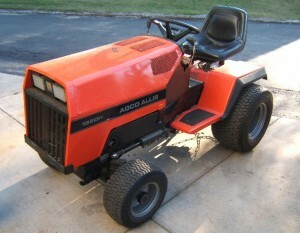 There is a Yahoo group/forum for Sears garden tractors. Joseph is the moderator and a pleasant, helful guy. If you check out their files and database sections there are some helpful guides for attachments. Following are a few Q&A’s we’ve answered about Craftsman garden tractors. 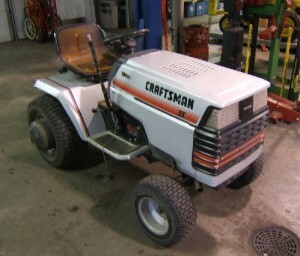 Q: We have a Craftsman Garden Tractor model # 917.257720. It stalls out after it warms up or is under load for a few minutes. We have given it a full tune up, replaced the gas filter, new carb, changed all the belts, changed oil and filter, adjusted carb. A: You need to check out your ignition spark quality. I sounds to me like you have a bad ignition coil. Q: Jim, I have a Craftsman tractor with a Kohler Command 20.5 hp twin engine. It runs fine cold and mows with no problem at all. When I am finished mowing (engine hot) and turn off the deck, the engine idle varies, like it is hunting for the proper speed when the load is released. It will run with this hunting idle until I turn it off. Once cool, it starts right up and idles smoothly again. Any idea of where to look to correct this problem? A: Yes, that sounds to me like a carburetor air fuel ratio problem. In other words, the carburetor is running lean when hot. You can check this out by putting the choke partially on and then I would say your engine will smooth right out. Q: I have an old Craftsman Lawn Wizard with a Kohler 20 hp engine. I have to replace the electric PTO, I guess it is the bolt in the center of the motor,however, everything spins when I try to remove the bolt, what is the trick to remove the pto? A: To check your PTO clutch, put an ammeter in series with your PTO clutch and check your amp draw. It should be 3 amps or less. If it is more, you need to replace the PTO clutch. The very easy way to get that front bolt loose is to use an impact wrench, it will come off without even holding onto the crankshaft. If you click the link above the picture to the left there is a short video of Jim in a tractor pull in 1992 with his garden tractor puller called the Geo. It had a 3 cylinder Geo engine in it. Q: I would like to build my own garden tractor puller, I have a garden tractor, what do I do next? A: You need to check with the people or association that you are going to pull with, find out the different weight classes they will be having pulls in, and get their list of rules. That will tell you what kind of garden tractors, engines, tires, weights, and safety equipment you can use. Q: My daughter has pulled lawn and garden tractors for the past two years in 1100 lb and 1400 lb stock classes with good success, but this year we are looking to step it up considerably. Our first year we used a Wheel Horse with a single cylinder 12HP – 8 speed and ran mid pack. Last year we used a Wheel Horse 416-8 with a twin 16HPp engine and finished in the money with every pull. This year I was looking to go with a Wheel Horse 520H, but a friend of mine who used to pull successfully in the past told me that the 520H was a great tractor, but would not pull as well as a gear driven because the hydro has no low range and just didn’t pull well. I then found a rare 520-8, but the same friend told me that this would be more power than I would need and would spin out. He suggested sticking to the 416-8. In my opinion, there is no such thing as too much power in pulling and that although they do weigh more, and you can’t put much weight on for the 1100lb class, a hydro might do well and the more horses the better, right? A: Yes, your correct, the hydro will do better with more horses. I would say you need at least 2 extra horsepower to stay with the stick transmission. You are also correct in saying there is no such thing as too much horsepower, if it had too much power that meant you should have been in a higher gear. Q: I have recently become interested in garden tractor pulling and have found a good buy on a John Deere 300. It will need a new engine, but my concern was more with the transmission and differential. Will the hydrostatic and rear end hold up good for a puller, or should I keep shopping? A: Do not worry about that transmission and rear end. I have already put a Chevrolet engine ahead of that package and didn’t even hurt it at 6000 RPM’s. 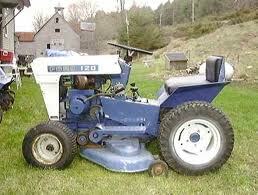 Q: I have a Yard Machine (Gold Series) 17.5 hp engine. Because of work I do not get to cut the grass until late evening, so I install a couple spot lights to allow cutting at night. Unfortunately the lights are draining the battery. What are my options? I am thinking of installing an alternator. is it very difficult? A: You should be able to order out a bigger amperage output alternator and rectifier and come up with enough power to stay ahead of your added lights. Hydro-Transmissions unit in it, number 90-4029. I would like to know which transmission oil to use. I have been told by one dealer to use Dextron automatic transmission oil and be another dealer to use regular hydraulic fluid. I would certainly appreciate knowing for sure which type of oil to use. A: I would use the red Dextron III transmission oil. 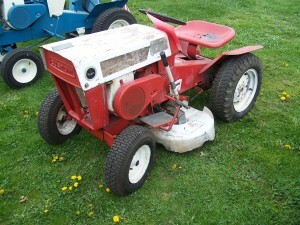 Q: Is there a way for me to test the alternator on my Toro Wheel Horse 520-H garden tractor? To be honest, I can’t even locate an alternator. According to owners manual the alternator is 12 Volt, 20 amp. Regulated. When the battery is fully charged the voltmeter reads 12 volts. As it discharges there is no voltage reading. The 30-amp fuse tests good. If you can help me locate the alternator I can check electrical connections. Apparently this is some kind of pulse alternator since I can’t locate it. The engine is an Onan P-220-G I/10955D. A: I think if you would install a new rectifier you would be working fine again. First make sure you have power to the center wire on the regulator with the ignition key on. 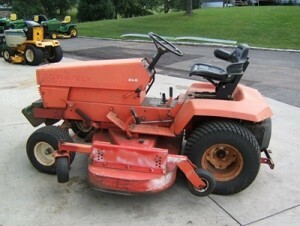 Q: I have a Scotts 2554 and the electric clutch makes a squealing sound when the mower is not engaged. When the mower is engaged the sound goes away. I understand that the clutch has a brake adjustment. How do I adjust it? The mower has a Kohler 25 hp motor with serial number 3034903061. If the bearing in the clutch is bad how much trouble is it to take it off and where is the best place to get a replacement part? A: You adjust those self locking nuts until you have about .010 clearance in the brake. It sounds to me like you have a bad bearing and on that clutch I do not think the bearing can be replaced. That would make you have to replace the complete clutch. Q: Help… mowing season is here and after servicing my Simplicity mower I now find that the mower starts and runs fine. However…when I engage the PTO the engine stalls. I replaced the PTO dash switch and unfortunately this did not help. Do you have any suggestions or thoughts that might assist me with my troubleshooting? Are you trying to fix your lawn mower or garden tractor? I hope you can find a little help either here on our blog or on our web site. I don’t know about you, but when I’m having trouble with something, the best answers I get to my problems usually come after a quick Google search of the problem. These are diagnosing and troubleshooting questions and answers about Cub Cadets. 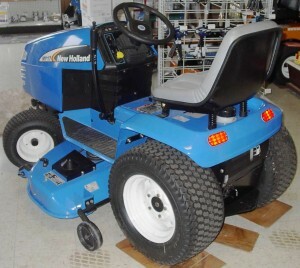 One of our web site pages also deals with Cub Cadet garden tractors and lawn mowers. Q: What can cause the PTO belt to break on a series 2000 Cub Cadet riding mower? Mine has broken three times and I donâ€™t want to replace until I can repair it. After replacing, I am able to get about half the yard mowed before it breaks again. All the pulleys seem to be moving freely. Can you help? A: Check if you may have a faulty belt tightener that is getting the belt so tight that you are breaking the belt. Also check when you raise the mower up, if that and see if that makes the belt much too tight. 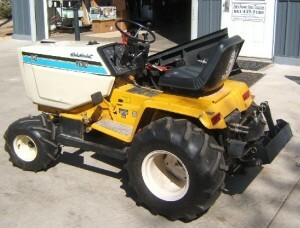 Q: I have a Cub Cadet 1440 Garden Tractor that I purchased new in 1995. Yesterday, I noticed the amp indicator light flickered at idle speed. It was a slight flicker for just a split second and then would flicker again in several seconds. The light never came on at full speed when mowing. With the tractor was running and I turned the headlights on, at idle speed the amp light is bright red and as I increase the engine speed the amp light gradually dims but never goes fully off. At no time did the tractor ever run differently from before or ever act like the engine was going to cut off. A: Check your charging voltage at the time the light is flickering. The charging voltage should be around 13 volts. If it is lower you could have a faulty voltage rectifier or maybe a bad cell in the battery. Q: I have a 2150 Cub Cadet garden tractor. The PTO occasionally will not engage, usually after its been running for awhile. If I switch it off and attempt to re-engage it just will not work and I can’t finish the lawn. Is it the clutch or the switch and what’s a good way to test? A: Check out your amperage draw on your PTO clutch coil after you have run it long enough, until it will not restart. Then check it and your amp draw should be about 2 amps maximum. If it is more, then you should replace the PTO clutch or PTO clutch coil. Q: I’m looking for a used John Deere riding mower but I am unsure of the model size that would work best for me. 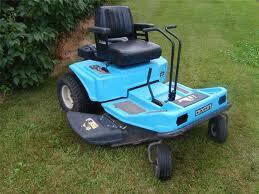 For physical size/storage I’m looking to stay between 100-300 series with turf tires and 38″ mower deck. I have a little less than 1 1/2 acre of lawn to mow, but I am also looking to use it during the winter to plow snow from sidewalks/driveways. The features I’m looking for are automatic transmission, power steering, hydraulics up front for a snow plow/snow thrower (preferably 2 stage), rear hydraulics for tiller, a snow cab, and a model that came with good front lights for night visibility. Can you tell me what year and model you would suggest so I can begin my search? A: Your 100-30 series will not cover your demands. It sounds to me like you should check into the X700 models if you are wanting something new. Otherwise, a John Deere 318 will do everything you asked for and so would a lot of the other older John Deere garden tractors. Q: I’d like your opinion. 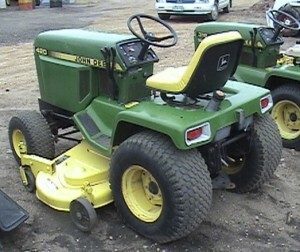 Which is better, the John Deere 318 or a newer John Deere 425? It seems they are both comparable in features and price. The JD 425 may be a couple hundred more for a machine with like hours. I know they have some different features, but it seems to me they are similar with both being 20 H.P. and having the hydraulic quick connects. The biggest difference I see is the differential lock and elimination of the two separate brake pedals on the JD 425, and the engine. Which would YOU rather have for the same money? I would like to do some landscape type grading for leveling up people’s yards and renewing lawns ( stripping off the root mat, grading, spreading blended topsoil, and reseeding, as well as providing mowing service). Do these tractors do a good job loosening up sod with a small disk harrow, or would it be better to get one of the John Deere rear mount roto tillers? I know I need a three point hitch and rear PTO for the tiller, but I also feel pretty sure you will have all the parts I need to make that work. If the answer is the roto tiller, then a front blade would be in order. If the disc harrow would work, a back blade wouldn’t be too hard to switch with the harrow, and I have experience with back blades and box scrapers. I have a gut feeling that the John Deere 425 would be a better machine for this type of work mostly because of the newer water cooled Kawasaki V-twin engine and the longevity and reliability it would provide. But, I also know the JD 318 is one of your favorite models. What’s your opinion on this? A: You are correct, I would much rather have a John Deere 425 with a water cooled engine. A tractor rototiller works much better than a walk behind rototiller. Q: I have a chance to buy a John Deere 425 garden tractor with a little over 700 hours on it. I tested it and all looks and sounds good. A friend knows the back ground of the tractor and all sounds good. It is a one owner and cut about three acres. Is this as good a tractor as the 318? Are there any short comings about the JD 425 that you know of or things I should look for? A: This tractor is rated with the John Deere 318 and John Deere 332 tractors. The only problem we have the 425, 445 is that the plastic camshaft teeth would break off from heat and then a new camshaft needs to be put in. It is not that big of a deal. 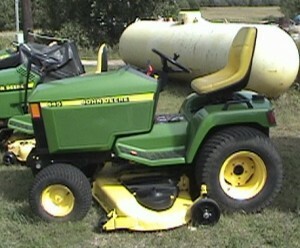 The John Deere 318 garden tractors were built from 1983 to 1992. 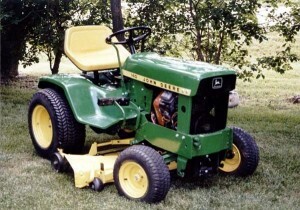 The John Deere 425 was built from 1993 to 2001. I am not necessarily saying newer is better. The 318 has a flat head, air cooled engine in it. The 425 has a V-Twin overhead valve, water cooled engine, 20 horsepower. All of this is much better than an air cooled engine and of course has 2 more horsepower than the 318. The 425 is smoother and quieter than the 318. The 425 has a posi lock rear end and no individual brakes. The 318 has individual brakes but no posi lock rear end. The 318 travels at 7.2 MPH and the 425 travels at 8.4 MPH. Q: I have taken a blown 13 HP Briggs and Stratton engine off my Dixon mower, model 4421 and a good, running donor engine which is a 15.5 HP Briggs and Stratton engine. I have made the wire connections match exactly has they were on the 13 HP that I removed. When I attempt to start the engine, I get what feels like not enough power to the starter. The starter engages the fly wheel and stays engaged even after I let off the key switch. I don’t even get a single rotation of the flywheel. I checked the battery and I am getting right at 13 volts. I can manually hand rotate the top of the motor where the plastic grille is with no problem. Is there something I am missing on this swap? Maybe the solenoid needs to be swapped out as well? The one thing on this swap that is different between the 2 engines, besides the horsepower, is the 15.5 had a fuel solenoid switch screwed in to the bottom of the carburetor assembly. The 13 did not. I unscrewed the switch out of the 15.5 and installed the screw that was in the 13. Everything fit perfectly. Surely this would not keep the motor from at least turning. Please give me your best thoughts on this scenario. A: Yes, it sounds like you are telling me that both engines have starter solenoids. If this is true that is your problem, are you trying to start your engine without a solenoid hooked between your starter switch and starter motor? Follow up: Just wanted you to know what the problem was with the engine swap that I emailed and called you about the other day. When my engine blew while mowing, I immediately turned off the ignition switch key and started looking to see what happened. Here is the kicker: I did not turn off the switch for the electric clutch, only the ignition switch. When I saw the hole in the side of the engine, I forgot about everything else and just started thinking about where to get a donor engine. So tonight while I am still troubleshooting everything, I am using that jumper wire again that you told me about, going from the battery positive post to the side of the starter post and I look down and notice the blade belts are turning as well. I look at the switch on the panel and sure enough, the clutch switch was still engaged. I switched it off and tried again and she kicked over like it was brand new. I guess the battery did not have enough juice to run the blades as well as start the engine. What a headache about nothing but yet what relief to know I had found the problem. So there you go. You were so helpful the other day and since I found the problem, just wanted to let you know that using the jumper wire I think is what saved me and you suggested it, so thanks. Q: I’ve had this Dixon rider with a Onan p220 engine for 15 years. It always ran ok, until now, I lost spark on it so I replaced the trigger module under the flywheel, put it back together, it ran okay for three weeks. It ran it out of gas one day so I put gas in it. Now all it will do is backfire, sometimes from the muffler and sometimes the carburetor. Sometimes when it fires it will stop the engine cold? and if you choke it a lot then take it off of choke it will try to run backwards for a lick or two. HELP anything come to your mind? A: You might have burned out that new module you put in because you did not put in a new ignition coil at the same time. Follow up: Replacing the coil did the trick. Thanks! I’m mowing with my rider not pushing with a walking mower! c: Get a different garden tractor. Obviously it’s best if you prevent problems with the hydro transmission before they happen. One of the most common and preventable causes of the hydrostatic transmission failing is pulling/towing the garden tractor. Just don’t do it, not even a short distance. If we need to move a non-running garden tractor around the shop we will even skid the wheels rather than take the chance of ruining a good transmission. 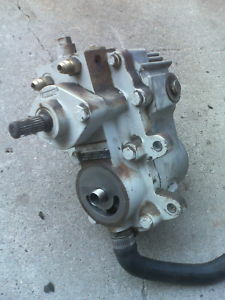 We specifically overhaul Sundstrand hydrostatic transmissions, there are other brands. These are a couple of e-mailed questions we have answered about Sundstrand hydrostatic transmissions. It will give you an idea of the symptoms of the hydrostatic transmission failing and a few things to check out before you overhaul or replace it. Q: I have a question concerning a larger piece of equipment. I have an older Ford front loader with the Sundstrand hydrostatic drive. About a month ago while moving a load of horse manure the unit decided to not move anymore. I called a friend and he guessed that it could be the neutral switch just out of adjustment. Ring any bells for you guys? I donâ€™t know anything about hydrostatic transmissions and am lost! 1. Check if the driveshaft isn’t stripped and slipping on the transmission. 2. Check the linkage going from your hand or foot control down to the transmission and make sure it did not unhook or fall off. 3. Also check on the arm that hooks on the shaft going into the transmission and make sure it is not slipping. 4. If you have a gear transmission behind your hydro transmission, make sure that it did not jump into neutral. 5. Then, did you check and see if you have a broken axle? 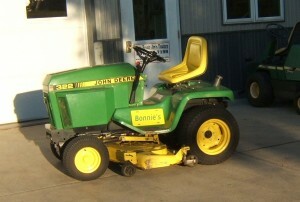 Q: I have a John Deere LX 176 lawn tractor, 38 inch mower deck, with a hydrostatic transmission. It has a few hours on it but is in good condition, with one small exception. It has slowly refused to climb the slope in my front yard. About half way up it simply gives up and makes a shuddering sound. This seems to also be aggravated by temperature. The colder it is the better it works and then as the tractor gets hotter it won’t back up even on a slight incline. I fear the hydro needs rebuilding, do you agree? A: First check to see if your traction drive belt is not slipping or you have a locked up idler pulley. Q: I checked both conditions as you suggested and both are to specification. It has a new John Deere belt. The condition as I described it before also gets worse as the temperature of the transmission rises. After an hour of use the speed in both forward and reverse slows with any change in grade. I have had several John Deere riding lawn mowers before and used them on the terrain with no similar results. A: Yes, I agree, you are correct that your problem is a bad hydrostatic transmission. It looks as though there might be 3 different transmissions, so we need to start with getting the serial number from your lawn tractor. Q: Jim, I have not used my tractor in about 6 months. I tried starting it but the tractor backfires during a higher speed and eventually will stop. I already replaced the gas filter, cleaned the air filter, and replaced the spark plug. What could it be? A: Make sure your valves are not sticking in the valve quires from sitting too long. Q: I have a question regarding my John Deere 316 garden tractor and a problem with the hydraulic blade sticking in position. The blade functionally is not the problem. we have switched the hoses around to verify that it is not the blade, also the handle linkage is not stuck. One of the four hookups does not allow the blade to return. We can make the blade go up, but cannot return it back down (also we can do the same with left to right if we switch our hook ups around). We have been putting the blade down and lifting the tractor off the ground and having the stuck hookup be the return that would lift the blade. We leave the handle in the down position and over about a 3 hour period, it will slowly release and set the tractor back on the ground. Any thoughts on how to release this sticking? The fluid used is the transmission fluid of the tractor, would a transmission cleaner additive work? A: It sounds to me like you will need to replace the double hydraulic control valve and see if that takes care of your problem. Q: Jim my problem with my John Deere 425 garden tractor is driving me nuts, The dealer says the switch is good, but seat switch was bad. Now it dies when you take the brake off, The PTO still does not work. Got any good ideas on this problem? A: Check your fuses, make sure the seat switch is okay, then remove the rear fenders and check out the wiring going from the seat up to under the dash. The John Deere 140, In 1968, was the first hydrostatic garden tractor born to John Deere. It had a 12HP Kohler engine. In 1969 John Deere changed the engine to a 14 HP Kohler. The John Deere 140′s were manufactured with the Sundstrand high gear hydrostatic transmissions up through the serial number 30,000 or 1970. 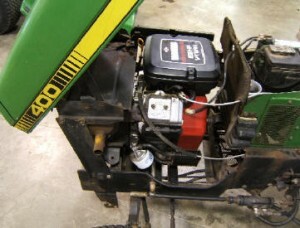 The garden tractors with the serial number 30,001 and above and built in 1971 and newer had the new style Sundstrand transmission. This transmission was used up through all of the John Deere 140′s, ending in 1974. That style hydrostatic transmission was used in all of the John Deere garden tractors including the 120, 140, 300, 312, 314, 316, and 317 ending in 1982. The John Deere 140 came standard with one hydraulic lever and 2 hydraulic couplers up front. On the 140 H1 John Deere you could special order individual brakes, headlights, and oversize 23×10.50×12 rear tires. Another special order option was the John Deere 140 H3. The H3 came standard with the whole works; triple hydraulics, headlights, individual brakes, and a cigarette lighter. Individual brakes came as a standard option on the 318, 322, 332, 420, and 430 garden tractors and ended as an option in 1992. 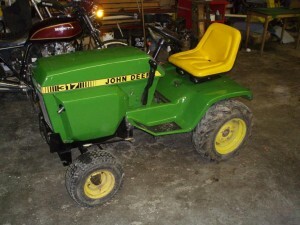 I bought my new John Deere 140 H3 garden tractor in November of 1972, making it a 1973 model from J&W Boat and Motor. We bought a JDX8 snowmobile at the same time. We made good use of the â€œH3â€ triple hydraulics, as I had the front 54″ blade mounted on the front and bought the optional hydraulic angling kit for it. At the same time I had a John Deere model 33 roto-tiller mounted on the rear, making use of all 3 hydraulic levers simultaneously if I wanted to. One lever is used to raise and lower the blade and has hydraulic down pressure on that same lever, it is built similar to the John Deere farm tractor design. The second lever was used to hydraulically angle the front 54″ push blade from left to right and right to left. 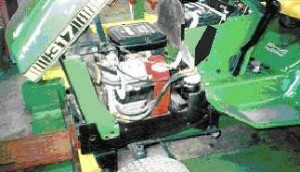 The 3rd lever is used to raise and lower the John Deere model 33 roto-tiller. This was a good combination to have together for tearing up and leveling ground. Two hydraulic couplers mounted on the rear of the tractor could be ordered as an option to run a 3 point hitch to use even more attachments. I personally had a roto-tiller, 49 snowblower, the 48″ mower deck, and a Johnson Workhorse front end loader. Other attachments I’ve had are a sickle bar mower, thatcher with engine mounted vacuum system and trailer, 54 inch front push blade, 54C center blade, 3 point hitch, and integral hitch. I wish they had come out with an hour meter, it would be interesting to know the great amount of hours on this machine. We use this tractor commercially to run our business. It has gone through three of the 1 cylinder, 14 HP Kohler engines and then in 1988 the Briggs Vanguards came into being. We installed a 14 HP, V Twin, overhead valve, Vanguard engine with an oil filter and oil pump. The repower ended all the engine headaches and this engine is running steady today with many many hours on it. I’m afraid this engine and tractor is going to outlive me! 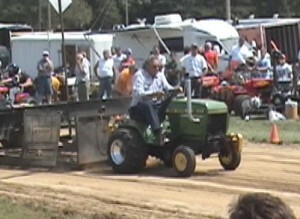 This tractor has been used in tractor pulling since 1973 and basically knew nothing but 1st place for years. I’m proud to let friends and customers try out my 140 to get a feel for the great sturdy tractors and the power of the Vanguard engines. Once in a while I even show off and do some wheelies with it. The price of my 1973 John Deere 140 H3 was $1745. $10,000 today wouldn’t buy you those kinds of options in a new John Deere garden tractor. 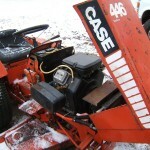 The Case garden tractor Yahoo group: http://groups.yahoo.com/group/casegardentractors/ is a great resource. At the shop we have been combining two Case 446 garden tractors into one working tractor and repowering it. 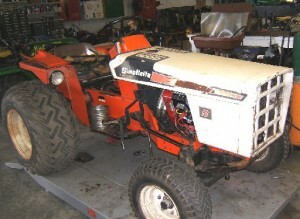 If you would like to check out the repower on the Case 446: http://www.jimsrepairjimstractors.com/case-repower-ingersoll.htm I told the owner I would find him an operators manual for the roto-tiller that came with them. I searched for quite a while and then asked on the Case Garden Tractor Forum. Within an hour at least two replies led me to where I could buy one. I check into quite a few other garden tractor groups that arenâ€™t brand specific and some that host classified ads and wanted to buy ads. This is just a sample of my favorites. I was surprised to find out Curtis Cabs isn’t making cabs for the garden tractors anymore. The smallest tractor they have a cab for is the John Deere 2210 or the Kubota BX 1800/2200. Where have I been? 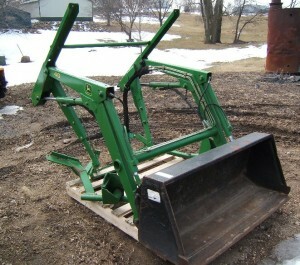 Someone called asking for a hard sided cab for a John Deere 455 garden tractor so I called Curtis. No luck. We have the Bercomac winter and summer garden tractor cabs but nothing hard sided. The Berco cabs are soft sided and quite light, and of course quite a bit less expensive. The Bercomac cabs are fully enclosed and will keep you warm and dry. We have a page to our web site: http://www.jimsrepairjimstractors.com/curtis-cab.htm showing the hard sided cabs from Curtis. They have a nice selection for the John Deere Gators, both the standard Gators and the HPX type Gators. Curtis has a handy snow plow / push blade for the Gator. A cab and a snow plow on a Gator would make a nice winter machine. Manufacturer: Deere & Company of Moline, Ill. Hazard: A problem in the manufacturing process could cause damage to the circuit in the interlock module. If the interlock module fails, the mower blades will be able to run with no operator on the tractor seat. Consumers could suffer injuries from contact with operating blades. 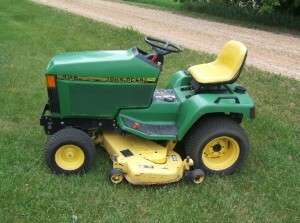 Description: These John Deere X300 Select Series lawn tractors are green with yellow seats and wheels. The following model and serial numbers can be found on the serial number plate on the tractor’s frame, which is located just above the front wheel axle on the right side of the tractor. 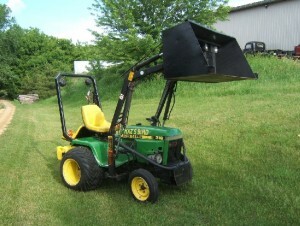 Sold at: Authorized John Deere dealers nationwide from April 2006 through May 2006 for between $2,800 and $5,000. Remedy: The company is directly notifying those consumers who purchased an affected tractor. Consumers should contact a John Deere dealer for a free repair. We have been expanding our web site and the information, services, and equipment we offer. It’s been an exciting change and a lot to learn. I (Bonnie) have been taking online classes and learning to make our web site, http://www.jimsrepairjimstractors.com, more professional and easy to use. New for Jim is offering free outdoor equipment technical support. While he has always helped people repair garden tractors and other equipment while talking to them on the telephone and with e-mails, he is doing a lot more of it now. He doesn’t know all of the answers but he knows quite a bit, and he loves those garden tractors! A few times we have looked to the Yahoo garden tractor forums to get more ideas from guys who also love working on garden tractors and the attachments. I will add some links here to the many forums, it’s a good resource. 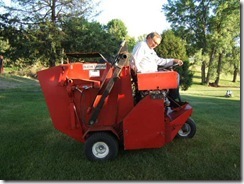 Even though it may seem the blog will only be about garden tractors, we’ll talk about some of the questions Jim gets e-mailed to him every day about all kinds of outdoor equipment and small engines.